A murder scene, but where’s the body? 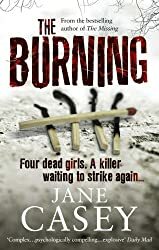 The first book in Jane Casey’s Maeve Kerrigan series was The Burning, published in 2010, but I didn’t get round to reading it until February 2015. I was hooked immediately and read the next five books in quick succession by the end of August 2015. These are all police procedurals, fast-paced novels, with intriguing and complex plots and developing the relationships between the main characters. So, I think that although the books read well as stand-alones, it helps enormously to read them in order. 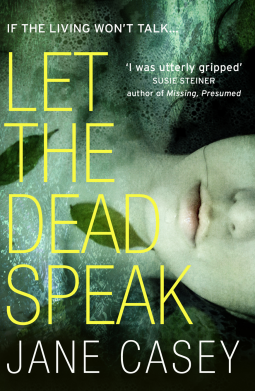 Let the Dead Speak is the seventh Maeve Kerrigan book (published today, 9 March 2017 ) and it is no less intriguing and complex than the earlier books. I loved it. When eighteen-year-old Chloe Emery returns to her West London home she finds Kate, her mother, missing and the house covered in blood. There may not be a body, but everything else points to murder. Maeve Kerrigan is young, ambitious and determined to prove she’s up to her new role as detective sergeant. In the absence of a body, she and maverick detective Josh Derwent turn their attention to the neighbours. The ultra-religious Norrises are acting suspiciously; their teenage daughter definitely has something to hide. Then there’s William Turner, once accused of stabbing a schoolmate and the neighbourhood’s favourite criminal. Is he merely a scapegoat or is there more behind the charismatic facade? As the accusations fly, Maeve must piece together a patchwork of conflicting testimonies, none of which quite add up. Who is lying, who is not? The answer could lead them to the truth about Kate Emery, and save the life of someone else. Let the Dead Speak continues to develop the detectives’ personal lives as well as detailing the investigations into Kate Emery’s disappearance. Maeve has been promoted and is now a detective sergeant (a long over-due promotion I think) and the murder investigation team has a new member, DC Georgia Shaw, a graduate on a fast-track scheme. Maeve finds her rather irritating. DI Josh Derwent is still her boss and neither he nor Maeve stick to the rules, but act independently as they see fit. The chemistry between the two of them is still there and is still full of undercurrents. DCI Una Burt is acting up as their Superintendent and the working relationship between her and Maeve is now improving. There are several strands to the investigation – first of all if Kate was killed where is her body and who had the motive and opportunity to kill her? If she was not killed why is there so much blood in the house, whose blood is it, and where is Kate? I enjoyed the fast-paced action, the interaction between the characters, both the police and the other characters. Chloe, who is very shy and lacking in confidence as well as in social skills is of little help in discovering what has happened to her mother. I liked the portrayal of the Norris family, Bethany and her parents and uncle, who are all members of an evangelical church, the Church of the Modern Apostles. Bethany refuses to answer Maeve’s questions and is openly hostile. Then there is the local ‘bad boy’ William Turner – what is his involvement? Similarly are Chloe’s father and stepmother and her step-brothers responsible in any way? I kept changing my mind about what had happened and who was the guilty party, but it had me foxed. And then when I had it worked it out the last chapter surprised me yet again with the twist at the end. Maeve Kerrigan really is an excellent detective. Thanks to the publishers via NetGalley for my copy. 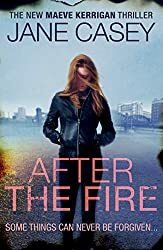 The book I’ve chosen this week is After the Fire by Jane Casey. I read this in June and have not got round to writing about it yet. There were 224 residents of Murchison House on the Maudling Estate in north London, and on a cold grey late November day not one of them was expecting to die. Some were hoping to die. some were waiting to die. but no one actually expected to die that day. This is the sixth book in the Maeve Kerrigan series. It stands well on it’s own, although there are references to past events and storylines that appear in the earlier books. The Maudling Estate and some of the minor characters featured in the 5th book, The Kill. After a fire rips through a North London tower block, two bodies are found locked in an 11th floor flat. But it’s the third victim that ensures the presence of detective Maeve Kerrigan and the murder squad. It appears that controversial MP Geoff Armstrong, trapped by the fire, chose to jump to his death rather than wait for rescue. But what was such a right wing politician doing in the deprived, culturally diverse Maudling Estate? Would you read on? I did and thoroughly enjoyed this book. I felt the familiar rush, the moment a shape began to emerge from the darkness that surrounded the case. A pattern. A connection. A witness and a suspect. A killer with a face and a name. The book begins in Richmond Park in London at 00.43 where a couple are badger-watching but to their horror are witnesses, albeit at a distance, to a murder. The victim is a police officer. But this is just the first murder and yet more police officers are killed. Maeve and her boss, DI Josh Derwent are part of the Met’s team assigned to investigate. They have no idea about the motive for the murders as the attacks seem to be random, from the first victim alone in his car (why was he there at that time anyway? ), to the officers of the Territorial Support Unit killed as they patrolled the Maudling Estate – is it a reaction to the police killing a young and innocent black teenager? The MP, Geoff Armstrong thinks so. This is a fast-paced novel, with an intriguing and complex plot and featuring characters that have appeared in the earlier books, developing their relationships. Some issues look as though they have been resolved, such as Superintendent Godley’s guilty secret, and others such as Maeve’s relationship with her boyfriend Rob, also a police officer come to a head, whereas Derwent and Maeve continue to have a confrontational working relationship and the interaction between them and DCI Una Burt gets even worse. I suppose it’s possible to read this as a standalone, but because of the back stories I think it is better to read them in order. I found it absolutely compelling reading. For once I’m reading a series in the order it was published -Jane Casey’s Maeve Kerrigan books – which is just as well as each one reveals facts from the earlier books. it also means that I can follow the characters as they develop and their changing relationships instead of trying to work out what had happened before. 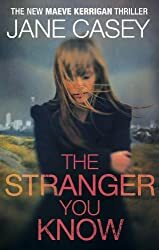 The Stranger You Know is the fourth Maeve Kerrigan book and it’s just as fast-paced and compelling reading as the earlier books – so tightly plotted that I just had to keep on reading to get to the end of the book. Three women have been murdered in their own homes – strangled and mutilated. There were no signs of a break-in – the women had obviously known and trusted their killer. One of the officers investigating the case voices the unthinkable – there are no leads, no DNA, no CCTV, no parking tickets, ‘it’s like he’s one of us‘. Suspicion lands on Maeve’s boss, DI Josh Derwent, who it turns out had been accused of murder as a teenager. His girlfriend, Angela Poole had been murdered in much the same way as the current victims and he had been the prime suspect. The focus is squarely on Derwent in this book and he is kept off the investigating team, leaving Maeve to work closely with Chief Superintendent Charles Godley and DCI Una Burt – who hates Derwent. But Maeve cannot believe he could be a killer and disobeys orders not to let him see the evidence. And as Maeve’s boyfriend, Rob is away in America, training with the FBI, the focus is also on the relationship between Josh and Maeve – her loyalty to him as she interviews the people involved in Angela’s murder – Josh’s friends and the police inspector in charge of the case. It is such a complicated plot and I kept changing my mind about the killer – was it Josh (surely not), was it Angela’s brother or one of the other teenage friends, or were the current murders the result of a copy cat killer? I like Maeve, although I do wonder why she is still a DC as she is so good at her job, ferreting out information from the slenderest of clues. I like Derwent, despite his difficult personality – the spiky relationship between the two of them provides such much needed comic relief in the book. There is a secret in his background that we, the readers, now know along with Maeve – and I’m wondering how long it will be until she tells him, although if he looks on Facebook as she did he’d soon find out. I hope he does – I’d love to see his reaction. It all comes to a dramatic and thrilling climax as Maeve, once again, comes face to face with the killer – and I’d had a sneaking feeling quite early one who it was, but had dismissed the possibility. 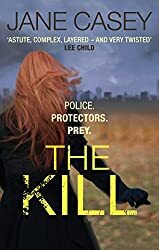 I’m currently reading the next book, The Kill and the sixth book, After the Fire is due to be published on the 18 June. 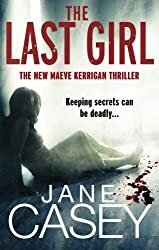 I liked the first two Maeve Kerrigan books by Jane Casey, The Burning and The Reckoning and the third, The Last Girl is just as good. I liked it mainly because Maeve is such an interesting character, and the book is fast paced and well written, with a multi-layered plot. Maeve, a detective constable, is the youngest member of the Met Murder Squad investigating the murders of Vita Kennford and her daughter, Laura, age 14. Lydia , Laura’s twin sister had found their bodies. Philip her father had walked in on the killer, received a blow to the head and was unconscious. There are no clues at the scene of the crime and as Lydia was outside swimming at the time she neither saw nor heard anything. Philip is a defence QC known for getting his clients off even if they are guilty and at first Maeve and her boss D I Josh Derwent concentrate their investigations on people who hold a grudge against him. Any one of them seems to have good cause to have taken revenge on his family. Unlike the earlier books, The Last Girl is narrated throughout by Maeve, so we see the events unfolding entirely through her perspective. Much of the novel centres on the Kennfords and their relationships. They are not a happy family. Philip is an unreliable husband, regularly unfaithful, not the sort who liked to be tied down to one woman. He is estranged from Savannah, his daughter from his first marriage. She refuses to speak to him and Lydia seems withdrawn, reluctant to speak to anyone. Maeve is sure they are all keeping secrets. And there is a sub-plot that harks back to the second book, The Reckoning, as the team is also investigating a number of gangland murders. Although this book does stand well on its own I think it helps if you read them in order particularly to follow the development of Maeve’s relationship with her boyfriend, Rob, also a policeman, now working in a different section – things between them are not going very smoothly and Maeve is having doubts. Meanwhile her working relationships with Derwent and Superintendent Godley are beginning to change as Derwent, a male chauvinist shows his softer side and she challenges Godley’s methods. Maeve has her suspicions about the culprit, but after a while I began to think she could be on the wrong lines as I had my doubts about the truthfulness of one particular character. And then it was fairly easy to work out who the culprit was. I thoroughly enjoyed this book and am looking forward to the next one in the series, The Stranger You Know.